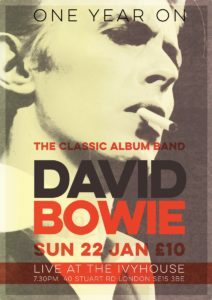 This Sunday 22nd January I’ll be doing the Bowie tribute band again at The Ivy House, almost a year since the last one. It’s a very eclectic gig, playing in the style of Bowie’s lead guitarists over the years, Ronson, Alomar, Slick, Fripp, Belew, Rogers and Leonard. Dan Maitland is bandleader and he’ll sing most of the lead vocals, except Starman which I’ll sing.